Shopping at a farmer's market is one of the easiest ways to eat seasonally and locally. Although the global marketplace allows us to eat almost any food from any region at any time of the year, eating food in season provides a host of benefits to both producers and consumers. Produce is at its nutritional peak when it is ripe; eating locally and seasonally brings the healthiest food to the dinner table. You can meet the people who grow your food whether at the farm itself or at a farmer’s market. Eating seasonally encourages creativity with recipes and introduces you to foods you may not have cooked with before. Buying food locally puts money back into the local economy and supports small farms and farmers. Local food usually comes from small producers that use sustainable methods on their farms to preserve the health of the soil. Eating from local producers you get to know means you can ensure their workers are being paid fair wages and their animals are treated humanely. Eating locally means produce is trucked a shorter distance than that which you purchase from a chain store, which means less air pollution is being released in transport. The easiest ways to find out what is in season in your area are to go to your local farmer’s market and browse through the stands or subscribe to a CSA (Community Supported Agriculture) and get farm-fresh produce directly from a local farm. The best way of all, however, is simply to grow it yourself in your garden. For a few more ideas about how to eat locally read “Ten Ways to Grow Your Own Food(shed)” from the Flourish Archives. Below is a list of foods organized by season along with a few infographics and visualizations to make finding seasonal foods clear and easy. Here is a short list of what is in season in most states in the U. S. throughout the year. 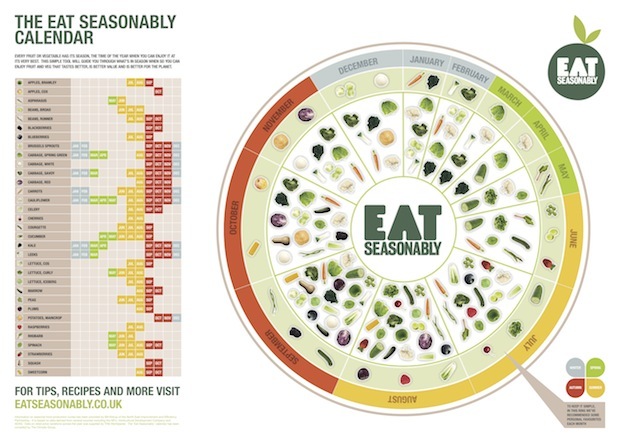 An interactive "food wheel" from Eat Seasonably. 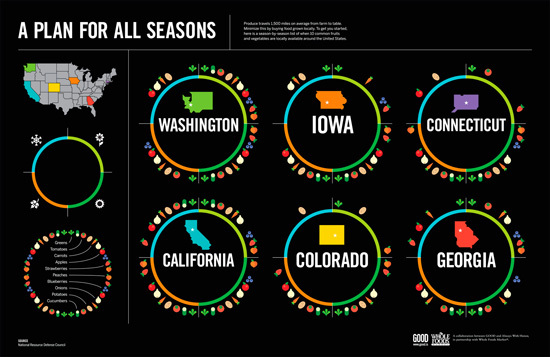 An infographic from Good Magazine with information about eating seasonally in states throughout across the U. S.